Are Macs Really More Expensive? Microsoft recently started a new advertising campaign which truly speaks to the consumers wallet in these troubled economic times. Simply put, the advertisement (can be seen here) states that PCs are cheaper than Macs, and what people are really concerned about these days is price. This ad is very much in line with the recent comments made by Microsoft CEO Steve Ballmer who stated that Mac users are "paying $500 more to get a[n Apple] logo on it". This however is not ground breaking news; the fact that Macs are more expensive (commonly known as the “Apple Tax”) is one of the most common retorts for the PC people in the Mac vs. PC debate. This new advertisement has definitely sparked up this debate quite a bit with articles being featured on Slashdot and Gizmodo, among many other tech sites. I have found myself in the Mac vs. PC debate quite a few times, generally when a friend asks for advice on buying a new laptop. In general the argument goes as follows, “PCs are cheaper, and the baseline specs are going to be higher, but Macs are known to be more resource efficient so the higher specs don’t necessarily mean a faster machine.” The conversation then generally returns to the issue of price where it is pointed out that a decent low-end Dell or HP laptop can be purchased for $700-$800 whereas with Macs the low-end is $1000-1100. The fun really beings when it is pointed out that while Macs are more expensive they generally have much higher resale value. While this is generally true, it was never clear to me how much higher the resale value actually was, and if that higher resale value actually covers the higher initial cost. That is why I chose to do a little research on the topic to answer the question, are Macs really more expensive than PCs? 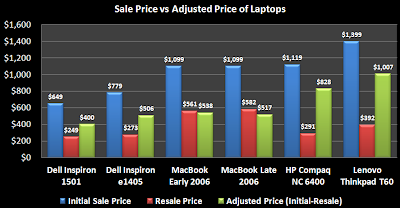 In order to determine which laptops are more expensive I would first find popular laptops which were released approximately three years ago, determine the resale value of these laptops today, then determine the “adjusted retail price” which is its initial sale price minus its resale value three years later. The decision to pick laptops which are three years old is twofold, first three years is generally the time frame which many people begin selling their old laptops and looking for new ones. Also, it was about three years ago that Apple switched from PowerPC to Intel. Based on these two factors three years seemed to be the ideal time frame for how old the laptops should be. These laptops were all released between two and a half and three years ago and are some of the most popular models offered by the given manufacturer at that time. Now that the laptops were picked their approximate resale value needed to be determined. While there are services which will tell you an approximate value of a laptop I’m not particularly confident in their accuracy. Instead, I wanted to see how much money these laptops would fetch if they were being sold by your average Joe. What better place to look then everyone’s favorite auction site, eBay. Using eBay I then located successfully completed auctions for each model listed above. When picking completed auctions I set aside a few ground rules, it had to be in working order and no large defects (as described by seller), it could not be refurbished, and it could not have a warranty. Considering laptops which violated any of these conditions would have significantly increased the variance in the prices (consider a “for parts” laptop vs. a working laptop with a 2 year warranty). I chose to sample three auctions for each of the laptop models to try to avoid any oddities in the sale price of a particular laptop. While this is a tiny sample size it was sufficient to get a reasonable estimate for prices, particularly since the sample pool was fairly constrained. It should be noted that some of the auctions for a given laptop model had slightly varying specs (e.g. 60GB vs. 80GB hard drive or 1GB vs. 2GB of RAM) but most were minor modifications likely done by the manufacturer, I avoided any laptops with significantly improved specs (e.g. 4GB RAM). While these improvements were likely paid for by the original buyer, determining how much these improvements cost at the time of purchase is an exercise I am unwilling to subject myself to. As a result, each laptop is considered to cost its base price, and thus the percentage of cost recouped upon resale is an upper bound. The full results of this experiment have been recorded in this Excel Spreadsheet, they have been summarized in the figure below. Figure 1 displays the initial sale price of each laptop along with its adjusted price which is simply its initial price minus the resale price. The adjusted price is in effect its “actual” cost assuming the laptop is resold in a working condition three years after it was purchased. From this figure it is clear that while the Dell Inspirons are sold at a considerably lower price point than the Macs, the adjusted price of the two models are very similar, particularly in the case of the e1405 which has a Intel Core 2 Duo processor (as opposed to the AMD Turion in the 1501). This indicates that while the Macs are in fact $200-300 more expensive than Dells, that extra cost is recouped upon resale as a result of Macs increased resale value. Next is the comparison between the Macs and the pricier PCs, namely the HP and Lenovo models. Both these models had price points above that of the baseline MacBook, with the Lenovo fetching a pricey $1,399. From these results it is clear that the PCs which do cost more than their Mac counter parts do not recoup nearly as much of their value upon resale and result in adjusted prices significantly higher than Macs. This is illustrated more clearly in Figure 2 which displays what percentage of the initial sale price which was recouped upon resale (higher is better). Three years after being purchased Macs recoup an impressive 51-52% of their initial sale price while Dells net around 36%. The more expensive HP and Lenovo recoup a measly 26-28% of their high initial prices. In the case of the Lenovo, its $1006 adjust price is nearly twice that of the Macs and Dells. In fact, while the HP and Lenovo are nearly double the price of the Dell e1405, they only receive an additional $20 and $120 in resale value. After seeing these results I am pretty clearly convinced that Macs are not more expensive than PCs. In fact, Macs are very much comparable pricewise to much cheaper Dells when resale price is factored in. Macs are much cheaper than more expensive models sold by HP and Lenovo which do not recoup nearly as much of their high cost upon being resold. While I’m sure this will not put to an end the Mac vs. PC argument, the old argument about Macs being more expensive is simply not the case, especially when considering higher end PCs. A special thank you goes out to Bryce Boe who proof read this post for me. Welcome to my new and improved blog now known as Regular Expression. It is now being hosted on the domain http://regexprn.com but http://jmkupferman.blogspot.com should continue to work (including RSS). After short amount of time coming up with a new name, a long time looking for domain names, a relatively short time making the design, and a really long time trying to make it into a Blogger theme, its finally made it. Its incredible how the "easy" parts take the longest time while the more difficult parts just seem to work themselves out. Unfortunately I was unable to get reasonably smooth looking text, so it ended up looking more like I had drawn the logo on a fabric softener sheet, and thrown it in the wash. I decided to abandon trying to write the logo out of the background text and just wrote it out normally and that looked much cleaner, and easier to read. I then went ahead and added a little navigation bar, in this case it is more of a link bar, but it looked nice and I was happy with the little bit transparency. 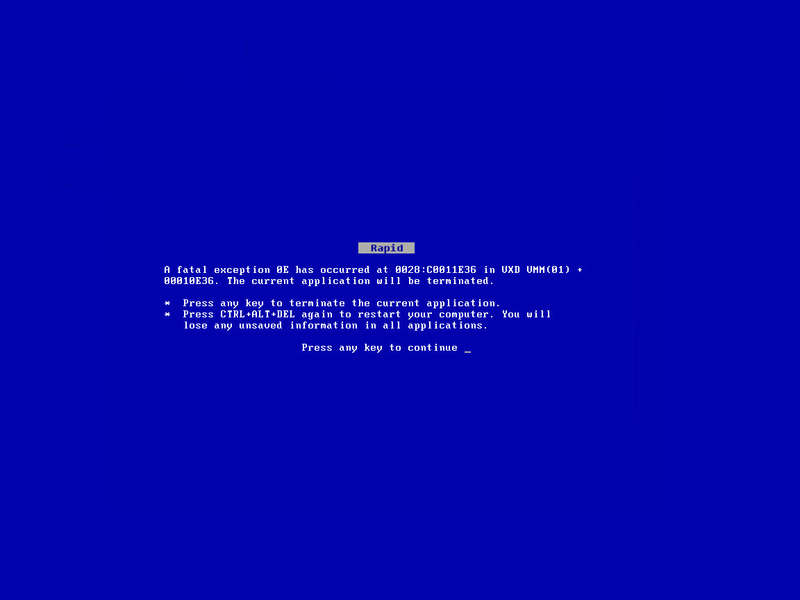 Since its just a blog all you really need is a header and color theme and your all done right? Sure, its just a matter of adjusting the template to fit the color scheme and you should be on your way. This is where things got a bit tricky. First, when trying to modify the template I couldn't get the links to work. It was incredibly bizarre since they worked in the simple HTML site I made and as far as I could tell Bloggers template engine wasn't doing anything funny. I just played around with the HTML using Bloggers template preview feature to try to nail down the problem. (insert a few hours frustration and relearning of the loveliness that is floats). Long story short, Bloggers template preview has a bit of an issue. It would render the links correctly, but they simply weren't clickable. It wasnt until I actually submitted a template (and made my blog ugly for a few minutes) that I figured out that it was preview that was the issue. How frustrating. I finally got the template looking alright so next it was time to figure out colors. What I very quickly figured out is that the black-grey-red combination I had was going to be difficult to work with. The accent color (red) was particularly tricky since its very difficult to find a shade of red that is readable for any decent sized line of text, say a title. While I could have used it in small spots like an underline or the numbers in the sidebar, it was gonna make finding other colors for text, titles, and links quite a bit more difficult. After looking around for a while to see if I could find a few ideas on what would work, I figured I would switch things up and try a lighter design. I had pretty quickly arrived at something which I thought looked pretty nice, still kept the theme, and was able to use red in a readable way. I was pretty surprised how quickly it came together and how nice it looked, and then I remembered why. It was a design I definitely had already seen before. Apparently my subconscious remembers websites incredibly well, even down to changing the red links to black with an underline on hover actions. That's no fun. So back to the drawingboard I go. I was playing around with templates and ended up with my light header on top, and old (dark) blog design on the bottom, and said hmmm. I liked the blue that I was previously using so I went ahead and changed the red in the logo to a nice cool blue, switched up the link colors and was on my way. The only problem left was the header, it was dark while the main background was white. I tried changing it back to the white one, but it wasnt working. Instead I kept the black, and just eased the transition between the two a little more. The first way was to just add a little fade below the nav bar, pretty simple. The second way is a little bit tricker and I actually stumbled upon it by accident, but I liked it. I'll give you a hint, while the nav bar is somewhat transparent it darkens the background as opposed to lightens it. After all of the messing around I finally ended up with the page you are looking at. Whats the moral of the story? Start with a diverse color pallete (kuler is a nice tool for that, thanks Mike) and then let the design come from that. Its a lot easier to not use a color in a pallete than it is to add an additional one. It will also likley stear you away from having a very plain black and white website, but dont go overboard. I mean at least Microsoft has the decency to make their error messages so cryptic and obscure that you have no choice but to give up. But this...I'm just so torn. Was it success? Was it an error? Or perhaps it was a successful error? Well in that case, congratulations! You've done it! Can you spot whats wrong in this image? Take a minute, really look if you haven't spotted it yet. In case your lost, the image is a screen shot of a GMail message which is being composed. The word highlighted in yellow is the GMail spell check feature pointing out that "ignorre" is likely a misspelled word (at least in English). The interesting part comes when you notice that the of all the words listed, the last one ("Ignore") is not a suggested spelling but in fact is the action to ignore the misspelled word. Tricky isn't it? Ok, so this example is somewhat contrived. If you were to misspell say, "spaghetti" as opposed to "ignore" the list of possible corrections would likely not include the word ignore so it would be somewhat more apparent that is in fact an action and not a suggestion. Even still, what indicates the fact that it is different then the other entries. Yep, its capitalized. Does that help, nope. What if you were unluckly enough to have started your sentence with with a misspelled version of ignore. Then your out of luck, no clues here except for the fact that the word ignore is duplicated, and even still which one is the suggested spelling and which is the action? You might be wondering why I am so concerned with the way in which GMail's spellcheck handles the word ignore. Do I have a compulsion to spell ignore with two r's which I can only fix via spell check? Not quite. Yet this illustrates a very simple point which is make clear distinctions or separations. No capitalization does not qualify as a clear distinction. A subtle separator probably could have done the trick, but still be considered somewhat ambiguous. What about the text "Ignore this word" or "Ignore 'Ignore'"? The first more clearly labels it as an action that would be complete which I am fond of. The second one might seem somewhat weird in this context, it would still be clear what you are doing, you are ignoring the word being displayed in quotes. Alright, time to get this high horse back to the stable. I guess I should probably note that I have absolutely nothing against GMail, I use it and like it very much. I actually was somewhat surprised since GMail is (or at least seems) very meticulously designed, in a good way. And..I picked on Microsoft earlier, so I'm an equal opportunity nit.